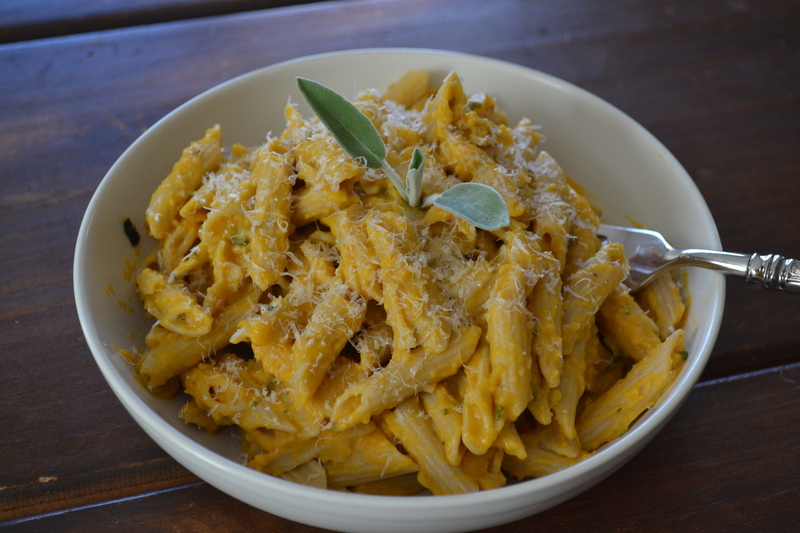 Butternut Squash is soooo good for you! This wonderful winter squash is so nutrious! Being a member of the gourd family, it’s cousins are pumpkins, melons, and cucumbers. Because of it’s orange color, the most obvious nutrient is Vitamin A, and this veggie is loaded with it! It is also rich in B complex vitamins, such as B6, thiamine, and niacin, and high in minerals such as iron, zinc, and potassium. It is heart healthy, low in fat, high in fiber and high in anti-oxidants! What is there not to like! While your squash is cooling, cut up and onion and sauté in butter and oil until soft – about 10 mins on medium low. Add 1 clove of garlic minced. 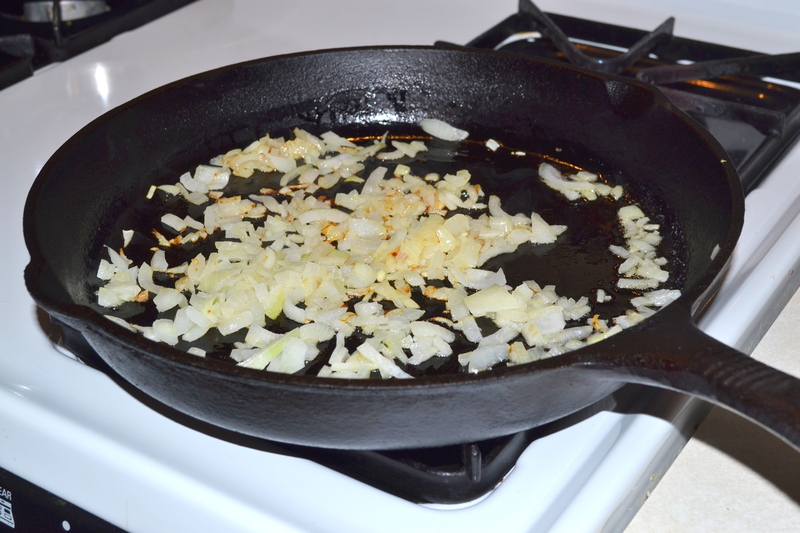 Saute a minute longer. Once the butternut squash has cooled enough to handle, scoop out the squash from its shell into your food processor. A blender may work if it is large enough. Add the onions and garlic, chicken broth, chopped fresh sage, dried ground thyme, salt, and nutmeg. Pulse until creamy and incorporated. Add the heavy cream, blend until velvety smooth. Pour into your cooked pasta, add parmesan cheese, and mix well. 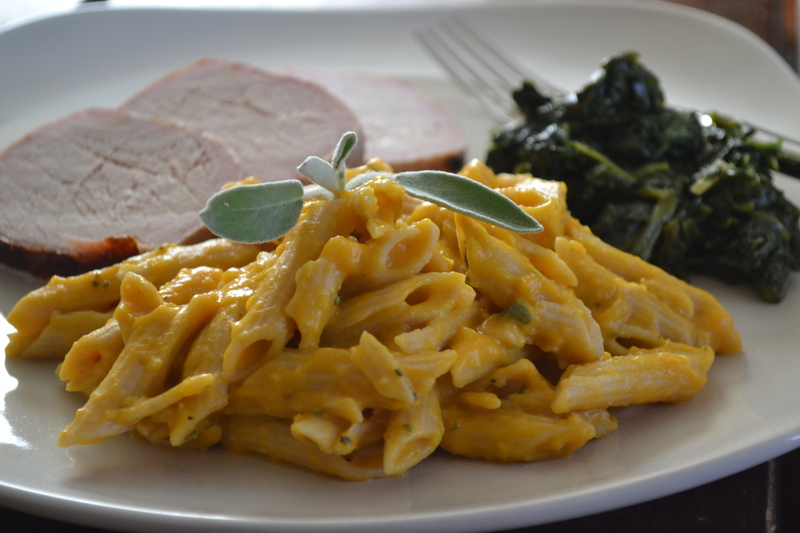 This sauce is so velvety and creamy, you will want to put it on everything. This dish will certainly bring health and nourishment to your body and soul! I spent this past weekend at a conference with one of my favorite pastors. What an incredible experience it was! I felt completely fed with the Lord’s Word through wonderful teachings, worship, and singing! It was SO nourishing! The Word of our Lord and Savior is as essential to our soul as food is to our bodies. Choosing foods that are high in anti-oxidants, good vitamins and minerals, and low in fat, etc, is an important part of our daily lives and benefits our bodies. Are we as concerned about what we are choosing to feed our minds? Feeling better and more energized is not only a result of healthy eating, and it is also a result of filling our minds with positive, inspiring, God-filled literature and information. His Word gives us hope and fills us with love and joy which makes us feel GOOD. You know, like how you feel after drinking a vitamin-packed green smoothie! Your feel good! So much of what we read and see on TV today is not benefitting us. We need to choose powerful and uplifting information or choose not to engage in it at all – it is kind of like saying “no” to those French fries! 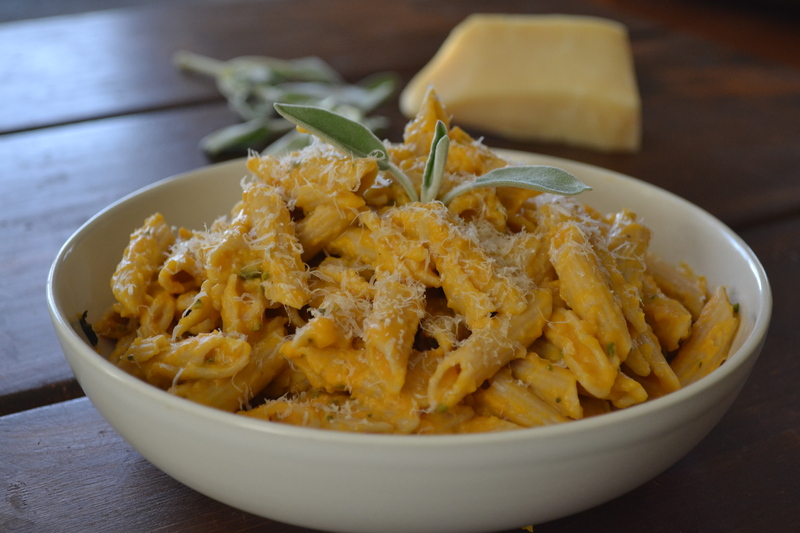 The Word of our Lord and his teachings will bring health and nourishment to your soul, and this Pasta with Butternut Squash Sauce will bring the same to your body! Be filled with them both! Preheat oven to 400 degrees. Start a pot of water for the pasta. 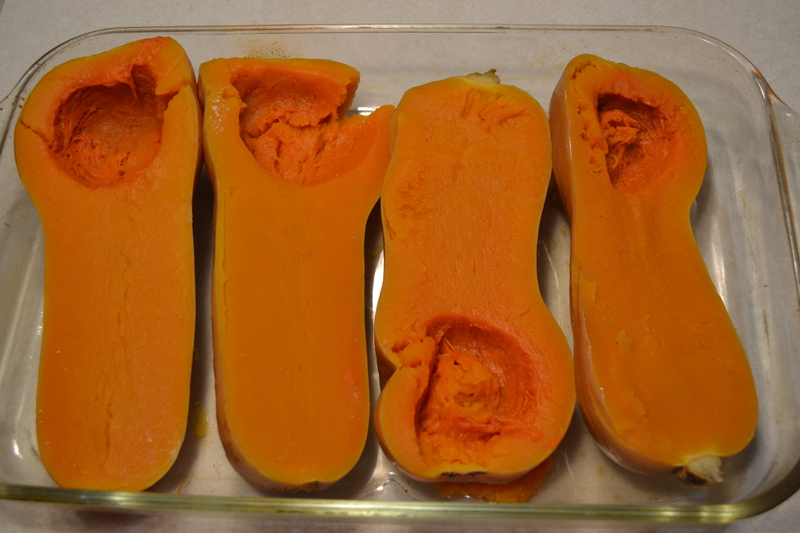 Cut butternut squash in half, remove seeds (save for later*) and place flesh side down in a baking dish. Bake for 30 minutes or until it is soft in the neck part when pierced with a fork. When done, remove from oven, flip them over and let them cool. Chop onion. Heat butter and a little olive oil in the skillet. Add onions and cook over medium low heat until soft and translucent. Add minced or pressed garlic. Cook for another minute. Remove from heat. When the water is boiling, cook the pasta until al dente. Drain and set aside. Scoop the butternut squash out of their shells and into the food processor or bowl/pot. I used a food processor, but you could use a regular blender (may have to do it in batches), immersion blender, or mixer. Either in the food processor or large bowl/pot, add the butternut squash, onion and garlic mixture, chicken broth, sage, thyme, nutmeg, and salt. Mix until well blended and smooth. Add the heavy cream and blend until velvety smooth. Thin the sauce with additional chicken broth, if necessary. The consistency should be pourable. Pour the sauce over the pasta, add parmesan cheese, and toss together. Top with additional parmesan cheese! *Tip – you may be able to find fresh butternut squash cut up in your produce section, just boil until soft. I have also seen it frozen, which can easily be microwaved. I’m not sure the equivalent to one fresh butternut squash, but my guess would be 2 packages. *To roast butternut squash seeds, wash them in a colander to help remove the strings and pat dry on a towel. Preheat oven to 300. On a baking sheet, add a tablespoon of oil and the seeds. Sprinkle with salt. Mix around so seeds are coated. Spread seeds evenly on the baking sheet. Bake for 20-25 minutes – until they are just starting to get brown. Remove and cool.